The Russian Army will receive new Armada battle tanks in 2015. These tanks are to replace the T-90s currently in service as the Armed Forces’ main battle tanks, said Lieutenant General Yury Kovalenko, former First Deputy Head of the Russian Defense Ministry’s Automotive Armor Directorate. “From 2015 the Army will see a new tank come into service, with fundamentally new specifications: a new automatic loader, and separate crew and ammo compartments,” the General said. This new tank will be an upgraded version of the T-90. The T-90’s predecessor, the legendary T-72, remains Russia’s main export-oriented tank and was a tank industry trendsetter. The T-72 has a 125-mm cannon and a carousel automatic loader with 22 rounds. This loader was also used in the T-90. However, even though the T-90 is rightfully acknowledged as being the most modern tank in service, it has its limits. Russia’s defense industry developed the T-90AM Armada tank in response to the Defense Ministry stated needs. Factoring in all the ministry’s requirements, this new tank features an engine that is 130 h. p. more powerful, a re-designed cannon and a new protected machine-gun unit. It is thought that the Armada will enable Russia to retain its leading position on the global tank market. All the Defense Ministry’s requirements concerning communications systems, armor protection and gun-sights were taken into account. “The industry must heed the criticism leveled at it by the Defense Ministry and draw the relevant conclusions,” said Igor Korotchenko, director of the Center for Analysis of World Arms Trade. He added that the Armada could be seen as being the first phase of response to this criticism. This new tank will be unveiled at the arms fair in Nizhny Tagil. The Russian Army currently boasts about 10,000 tanks, of which just 10-12% could be considered truly modern. 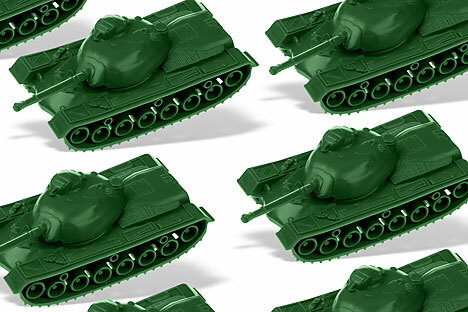 A few years ago Russia had 23,000 tanks, while the Soviet Union had over 60,000. General Kovalenko said “even 10,000 tanks is a bit over the top, there should be some rationalization here.” The new T-90AM should go some way to realizing this goal. Some analysts believe that tougher Defense Ministry requirements and a reluctance to buy outdated military hardware have spurred the defense industry’s development. For example, the industry is currently working with scientists to develop a standardized platform for future tank models.